All transactions are safe and secure with a reliable history in online purchasing behind each of our associates. 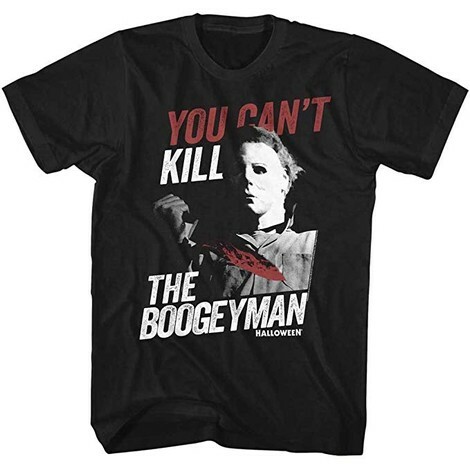 Buy the Halloween You Can't Kill the Boogeyman t-shirt to own Halloween clothing and merchandise. You can't kill the boogeyman, but he might spare your life in one of these Halloween tees. Nobody knows this better than Dr. Sam Loomis (Donald Pleasence), Michael Myers' psychiatrist. The front of this shirt displays Haddonfield's most notorious boogeyman. Also on this Halloween t-shirt is the movie logo. Buy this piece of Halloween movie merchandise with one of the Haddonfield High School Michael Myers t-shirts. Tell everyone that you and Loomis tried to kill the Boogeyman, but now he's back from the dead. In addition to the Halloween You Can't Kill the Boogeyman tee above, browse the Halloween Clothing Gallery for more apparel like men's and women's clothes, kids shirts or hoodies.